Clarets boss Sean Dyche is delighted with the progress being made on the redevelopment of the Barnfield Training Centre at Gawthorpe. Work began late last year, and is scheduled to be completed in the summer, on the 73,000 m2 area, which will bring first class facilities for the first team, development squad and youth team players under one roof for the first time. The club received permission to raise the standard of the facility to meet the Elite Player Performance Plan (EPPP) Category 1 and 2 standard of infrastructure, which currently stands at Category 3. Outside, there will be three full-sized training pitches, each measuring 68m x 105m. For youth team players, in addition to the current match pitch and four mini-pitches, there will be a further two three-quarter size pitches. On the south side of the river, the existing top pitch is to be floodlit. The centre will be a physical legacy of manager Dyche’s time in charge of the club, with the cost, in excess of £10m, funded by Burnley’s last season in the Premier League. 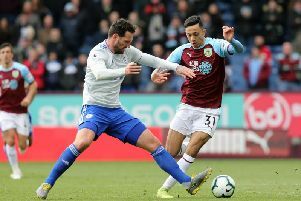 Dyche said: “It’s really good, they are going to start with the aesthetics and the finish, deciding on that – that’s how far down the line they are with it. “It’s about how you want it to feel, that sort of thing. “So the structure is all there, it’s really good. “We just need to give it a dress now, how we want it to feel. We’re getting closer now, not quite finished. The redevelopment alone isn’t enough to make the step up to Category 1 or 2 status, but is a big step towards attaining that, as Dyche explained: “It’s not as simple as that, just yet, but the big thing about the new building is the layers of the club can all go in the new building, so the youth system, mainly at our level the Under 18s, going into the Under 23s, the Development Squad, going into the first team, can literally allign on the pitches and in the building. “We like that idea of aspirational thinking, the idea, kind of, that if you’re on the furthest pitch, you’re probably the 18s, and as you go up the ladder, you’re getting closer and closer to the first team. “In the building there will be levels where the youngsters will work and move through the building into the first team area. Dyche added: “I’ve had one of the rare cases where the club and myself have been aligned with what the club is, what it needs and how to move forward, we’ve had solidarity within that. “In the last Premier League campaign, people could have said ‘well you need to change the manager’. “But they said ‘no, we understand the market we’re in’. There’s still a bit of reality here. “I don’t think it will last forever. “We have a solid board and solid fans and they believe in me and the team, but it still gets questioned and stretched at some point.